A quick look at all the variants of the newly-launched 2018 Hyundai Santro and what all features do they offer. The much-awaited Hyundai Santro has been launched in India with prices starting from ₹ 3.89 lakh (Ex-showroom) for the base-spec D-Lite variant. In terms of features, the base variant of the Hyundai Santro offers a driver-side airbag, ABS & EBD, power steering and a folding rear bench, to name a few. However, where the base variants of the Tata Tiago (Tiago XB) and the Maruti Suzuki Celerio (Celerio LXi) offer body-coloured bumpers, the D-Lite variant of the Santro comes with non-painted black bumpers. 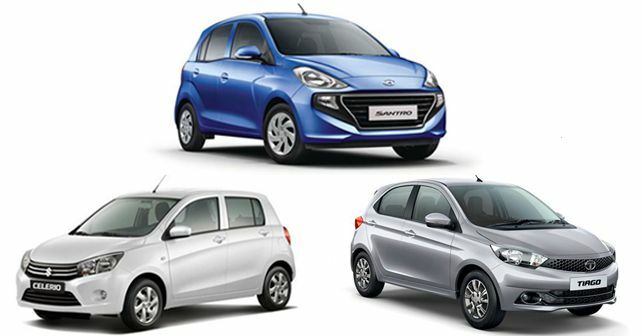 Now, here's a closer look at the features offered by the more popular and relevant variants of the Hyundai Santro and how the offerings of each variant differ from the corresponding ones of the Celerio and the Tiago. Now, coming to the most important aspect of the comparison, a look at the price range of these three models. It's worth mentioning that the prices mentioned for the 2018 Hyundai Santro are introductory prices, applicable only for the first 50,000 customers. Also, all the price figures mentioned below are Ex-showroom.